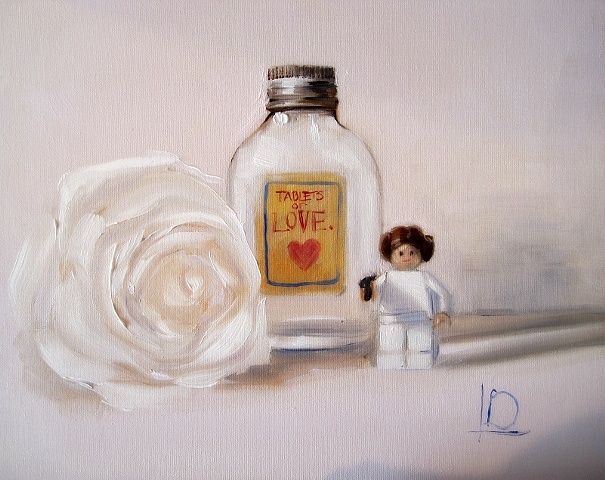 Love pills, Star Wars favourite Princess Leia, Lego, and a single white rose all feature in this small painting of white objects. I've been busy painting lots of commissions for people, and promised myself a little break from them to paint something fun! I'm also trying to expand my palette a bit, and practise painting in shades of white, as well as painting glass objects. The rose and the Lego figure were hanging around the studio hoping to get in on a painting... and the glass bottle is a vintage find from a flea market.